Daigo Umehara is a world class champ. You? You might be a world class chump. 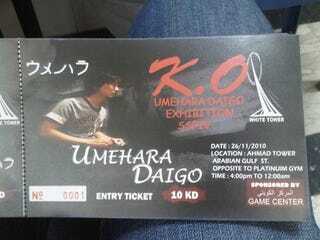 Gamers in Kuwait apparently have a chance to go one-on-one with Daigo. According to website Lucky Generation Gamers Podcast, the top Street Fighter player will be in Kuwait for the "Umehara Daigo Exhibition" at White Tower, a well-known arcade in Kuwait, on November 26. The event will feature a Q&A, a Daigo Challenge and more. It costs 10kd (US$35) to enter and 5kd ($18) to play Daigo in a match — make that, to lose to him in a match. Daigo is one of the most well-known fighting game players. I once interviewed him as he nonchalantly blazed through Street Fighter II. He's quite good. For those planning on entering, you might want to check out his fighting game tips.